What sets Indian cuisine apart from a lot of others is the spices. In fact, it is for these spices, the traders from all over the world came to India. Spices is what makes the Indian cuisine special. All the same you just don’t douse the food with spices. Which spice to add and how much is the essence of Indian cooking. For the poor souls like me who don’t know all the spice proportions or don’t have time to prepare fresh spices every time, there is still hope. Unlike Vasco da Gama or those European traders we don’t have to cross the seven seas. Just go around the corner to the nearby store. In my case I simply had to reply to a review request for spice mixes by Eastern Condiments. And the spices landed at my door step. 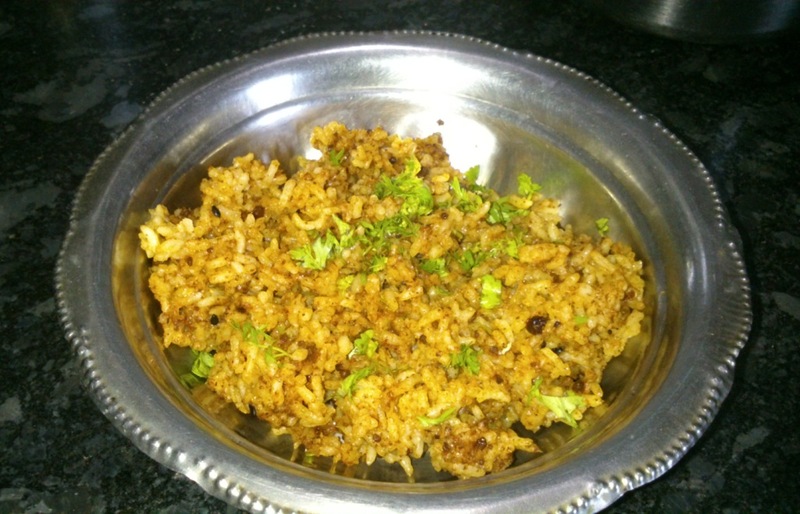 Puliyogare/ಪುಳಿಯೋಗರೆ/tamarind rice is a traditional South-Indian recipe. The mixture can be prepared and stored for a long time and mixed with rice while eating. And if you don’t know how to prepare the mixture. 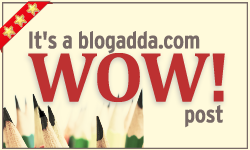 Here is a super-quick way to make it. Heat about 2 & 1/2 tablespoons of cooking oil. Add 4 tablespoons of Eastern Puliogare. Stir for about 2 mins. Add about 600 gms of rice and mix thoroughly. 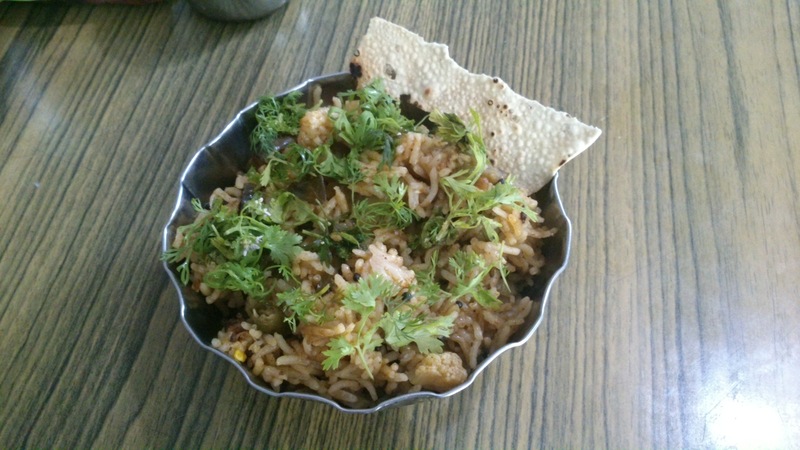 You may or may not relish brinjal but Vangi Bhath/Brinjal Rice is surely a dish you will relish. Again the method is simple. Fry Brinjal and other vegetables of your choice with a pinch of turmeric in cooking oil and keep aside. For the tempering, to heated cooking oil add mustard seeds, gram dal, green chilli, hing and cashew nuts. To this add and stir fry about 3 & 1/2 teaspoons of Eastern Vangi Bhath powder, tamarind extract, shredded coconut(optional) , salt and jaggery. Add the veggies and brinjal. Add uncooked rice and mix them well. Now add required amount of water for rice and let the rice cook. While neither of these need any side-dishes, you can eat it with some nice hot papad or pickle. My mom prefers it with thin Majjige Saaru and I like it with thin coconut chutney. 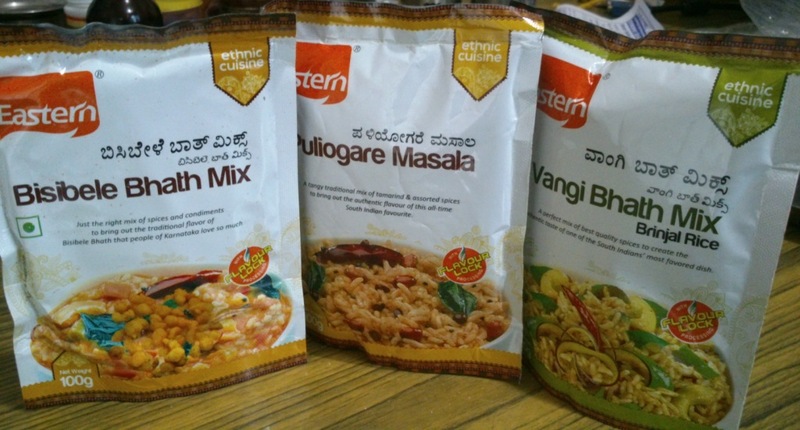 Hope you try them out and love the dishes too 🙂 Thanks to Eastern Condiments for the spices. Made my long weekend at home a tasty one!